Hronis Racing's Accelerate retained his hold atop the NTRA Top 10 Thoroughbred Poll for the ninth consecutive week as virtually all of the top U.S.-based horses in training continue to point for the Breeders' Cup World Championships on Nov. 2-3 at Churchill Downs. Accelerate, who received nine first place votes and 346 points, recently was installed the 3-1 favorite in future wagering on the $6 million Breeders' Cup Classic. Retired Triple Crown winner Justify was second in the Top 10 poll with 27 first place votes and 322 points. Two other horses—Imperial Hint and West Coast—also received first place votes. Twinspires.com Breeders' Cup Sprint contender Imperial Hint (one first place vote, 157 points), moved from sixth to fifth place in this week's poll while Classic contender and 2017 Eclipse Award-winning Champion 3-year-old West Coast (one first place vote, 119 points) was ranked eighth. The versatile Mind Your Biscuits, who is under consideration to compete in three different Breeders' Cup races, was third in this week's poll with 211 points. He was followed by Distaff contender Monomoy Girl (fourth place, 207 points). Travers Stakes hero Catholic Boy (146 points), also being pointed for the Classic, fell one spot to sixth place in this week's poll. He was followed by Yoshida (seventh place, 142 points), West Coast, Catalina Cruiser (ninth place, 94 points) and Sistercharlie (tenth place, 74 points). 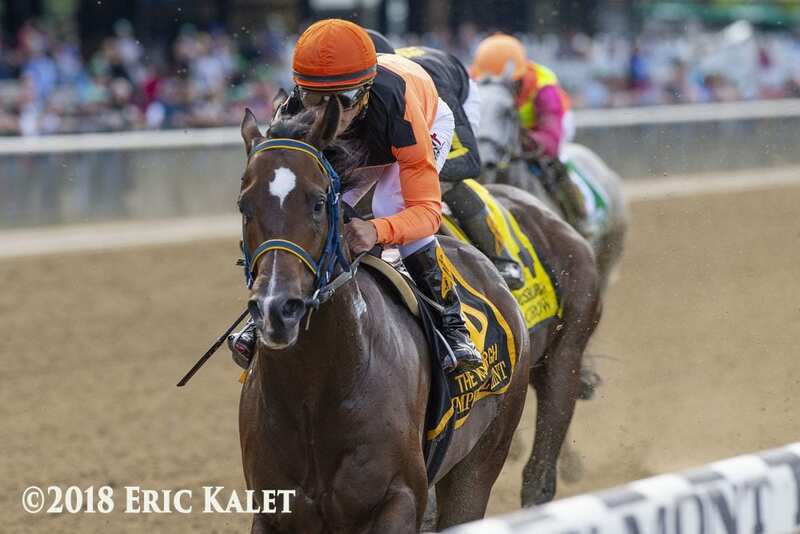 This entry was posted in Racing and tagged accelerate, imperial hint, Justify, mind your biscuits, ntra top 10 thoroughbred poll, Thoroughbred poll, west coast by Press Release. Bookmark the permalink.